1967 Ghia 1500 GT - This is a Ghia built car based on the Fiat 1500. The wheelbase is shorter than the Fiats, and Ghia massaged the 1500 cc engine, managing to get 84 HP out of it. The Ghia GT was capable of doing 100 MPH. Ghia produced a number of different cars under its own name, but the 1500 GT was by far the most successful of the bunch with somewhere between just under 700 or just over 900 of them being produced between 1962 and 1967. (The small Italian auto manufactures were notorious for keeping poor records of the number of cars they built) It is rumored that 50 or so were imported to the US. It's hard to tell from the car being offered on eBay, but this is a really beautiful car. Ghia was one of the top Italian design houses in the sixties and they got everything right with this car. Even though this car is rare it's not very valuable. (In 2008 one in very nice condition sold for $12,000.00) The car being offered on eBay is a complete basket case. Trim parts are almost impossible to find and replacement panels for the rusted sheet metal would have to be custom made. You will easily spend far more money putting this car together than it's worth. You will have to be incredibly skilled with a MIG welder and have unlimited time, resources, and patience to take on this car. An up to date tetanus vaccine and a prescription to Xanax would be helpful, too. Restoring this car would be an extreme labor of love, but I'd love to see someone do it. Ghia1500GT.com is an enthusiast website dedicated to the cars. It has some good info and pictures. AACA Museum - I'm not familiar with the AACA (Antique Automobile Club of America) or their museum, so I'm posting this based on what I see on their website. The museum located in Hershey, PA, which makes it a nice weekend drive for me. It's now on the list of places I'll visit. They have an Adopt-A-Car program. This is a pretty cool idea, based on the adopt an animal type of programs zoos have. Reality Check: Donating money or time to people and causes that need help is one of the best things you can do in life. It feels great. The AACA Adopt-A-Car program is a no-brainer for car geeks. However, if, like me, you do not have unlimited funds to donate, do not donate to this cause over a cause that helps people. Food, shelter, health care, education and everything else that helps people survive or achieve their goals is more important than making sure an old car gets its monthly detailing. That's reality. If you have the money to help people and help this museum, do it. If not, choose people first. 1960 Rambler American Station Wagon - The only reason I'm pointing out this car is because the seller listed it as a "Babe Wagon". To think, all these years I've owned BMWs, Alfa Romeos, MGs, Triumphs, Sunbeams, Audis, Saabs, etc., etc., and the "babes" haven't paid a bit of attention to me. All I really needed was a Rambler station wagon. This car is actually kind of cool for what it is. The seller, who obviously has a sense of humor, states that the car runs well and is essentially sound with just a few spots of rust. 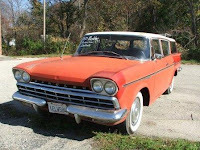 Located in Williamstown, MA, click here to see the eBay listing for this 1960 Babe Wagon. 10 Best Selling Cars Ever - Import car mechanic extraordinaire and friend, Jeff, sent this to me the other night. It's a list of "The World’s 10 Best-Selling Cars Ever". Most are pretty easy to guess, but #10 surprised the hell out of me. Click here to see the list. Do you really want to meet the babes who are attracted to an AMC station wagon????? Woooooow.... I NEVER say this, but that Ghia is just too far gone to deal with. It needs an almost complete reskin, and that's just the stuff you can see on the outside. I've passed over parts cars that look better than this. No way he gets opening bid. That Ghia might be too far gone to even be a parts car. Too bad. There was a dealer in Chicago who imported 50 or so back in the day.